What's New on DC Universe: BATMAN REBIRTH, INJUSTICE: GODS AMONG US, and More! Although we recently celebrated the 20th anniversary of the animated classic Batman Beyond, we can't forget the series that started it all: Batman: The Animated Series. (After all, without Kevin Conroy's portrayal of the Dark Knight in that seminal show, we would have never had "Old Man Bruce" in Batman Beyond!) So if you want to show your love for BTAS, be sure to enter our Batman: The Animated Series Swag Sweepstakes, starting this Friday, January 25th, and ending February 1st. And just so we don't make it all about Batman and forget about his "World's Finest" partner, Superman is the subject of our latest poll. Or should we say SuperMEN, as The Reign of the Supermen is upon us at last in animated form; and we want to know which of the four substitute Supermen you are. Are you a brash young Superboy, a stoic Man of Steel, or is the aloof Last Son of Krypton more your jam? Be sure to let us know in our "It's Reigning Supermen: Which Do You Choose?" poll, starting on Monday, January 28th, at 9AM PST. If Reign of the Supermen has you in the mood for more '90s adventures of the Man of Steel, be sure to check out some great Superman stories of that era in Action Comics #670-682, and #700-713, as well as the Superman vs. Shazam! story in Action Comics #768, and the seminal anniversary issue, Action Comics #800! For more Kryptonian adventures, Superman's acclaimed 2003-2004 limited series Superman: Birthright, which gave us a modern take on Kal-El's origin, is also available in its entirety. If you're in more of a Gotham frame of mind than a Metropolis one, we've Scott Snyder's All-Star Batman #1-9, featuring the complete stories "My Own Worst Enemy" and "Ends of the Earth." Don't miss out on these riveting tales from one of the Dark Knight's most acclaimed contemporary writers! 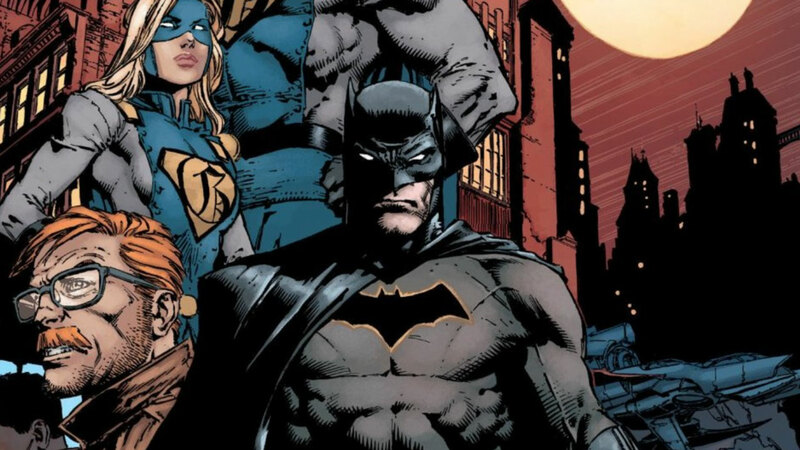 And if that STILL hasn't satisfied your thirst for all things Caped Crusader, then check out the first several story arcs from writer Tom King's acclaimed Rebirth run on Batman (pictured above), featuring Batman #1-24, in which Bruce Wayne finally gets serious about Selina Kyle. Included in these tales of the Dark Knight are "I Am Gotham," "I Am Suicide," and "I Am Bane," along with the Rebirth-centric Flash crossover, "The Button" -- including both issues of the crossover from The Flash. Other Gotham-related comics now available include the New 52 Birds of Prey series, issues #1-13, as well as the classic Birds of Prey arcs "Manhunter", "Revolution", and "Wolves". If Black Canary, Huntress, and Barbara Gordon aren't enough for you, there's that OTHER lethal Gotham lady, Harley Quinn, with the first 21 issues of the Harley Quinn Rebirth series available now as well. Are you one of those fans who watched Aquaman in the theater a few times? If so, you might be craving more adventures of the King of the Seven Seas. Well, good news! We have more available to read -- including the latter half of the Aquaman New 52 run, featuring the stories "Sea of Storms," "Maelstrom," "Exiled," and "Out of Darkness." One of Aquaman's Justice League compatriots gets his own solo series when Cyborg Rebirth takes us into the mind of Victor Stone (in the "Imitation of Life" story). For a more cosmic flavor, the Green Lantern Corps: Edge of Oblivion will take you to the outermost depths of the galaxy. While the OMAC Project limited series features some of DC's most iconic characters pitted against a powerful A.I. And last but not least, for one of the most controversial interpretations of the Justice League yet, be sure to read the Injustice: Gods Among Us series, which takes you to an alternate world where things get just a wee bit out of hand for the World's Greatest Super Heroes. You can now read Injustice: Gods Among Us #1-36 and take a wild trip through an alternate universe, inspired by the ever-popular video game of the same name. What are you reading right now on DC Universe? Be sure to let us know in our Community!